View More In Oils & Fluids. 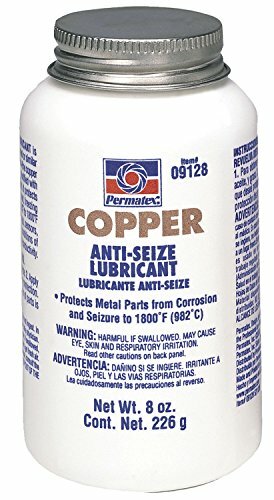 Permatex Copper Anti-Seize Lubricant is a premium quality copper anti-seize and thread lubricant that may be used to prevent seizing, corrosion and galling where high temperature conditions exist. Contains a high percentage of micro-fine copper flakes in a semi-synthetic grease carrier and is fortified with high quality rust and corrosion inhibitors. With a temperature range of -30 degrees Fahrenheit to 1800 degrees Fahrenheit, this lubricant is ideal for spark plug threads installed in aluminum, exhaust manifold bolts, engine bolts, oxygen sensors, knock sensors, thermostat housing bolts, fuel filter fittings, and battery cable connections. From special-mission, job-specific lubricants, protectants and dressings, to the rigors of heavy-duty needs, count on Permatex to bring you reliability and problem-solving solutions that extend the life of your equipment.